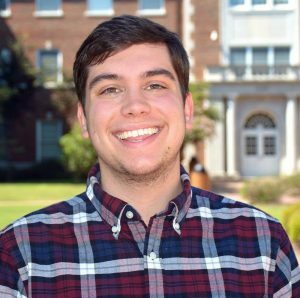 The University of Central Arkansas has announced that Danny Baxter has been awarded a Fulbright U.S. Student Program grant for the 2018-19 academic year from the U.S. Department of State and the J. William Fulbright Foreign Scholarship Board. Baxter, a Clarksville native, graduated in May with a double major in English literature and modern languages, with a minor in Honors Interdisciplinary Studies. As a Fulbright awardee, Baxter will serve as an English teaching assistant at the Universidad Nacional de Colombia in Palmira, Columbia. Baxter is one of more than 1,900 U.S. citizens who will conduct research, teach English and provide expertise abroad for the 2018-19 academic year through the Fulbright U.S. Student Program. Recipients of Fulbright awards are selected on the basis of academic and professional achievement as well as a record of service and demonstrated leadership in their respective fields. “I cannot wait to be able to serve my country as a positive representative and to disseminate the knowledge I have been given to others. I am a firm believer in using the opportunities you have to benefit others, and that is what I hope to do during my time in Colombia,” Baxter said. At UCA, he served as a writing tutor, chair of the Honors College Ambassadors, member of The Big Event committee, LEAD Team member, member of Sigma Tau Delta and is a Community and Economic Development Fellow in the UCA Center for Community and Economic Development. After returning from Colombia, Baxter plans to attend the University of Washington in the fall of 2019 to pursue a Master of Public Administration at the Evans School of Public Policy and Governance. He hopes to use his education and experience to work in the public sector and positively impact the lives of American citizens. The Fulbright U.S. Student Program is administered at UCA through the Schedler Honors College under the direction of Dr. Allison Wallace, associate professor.